Festival season has wrapped; now, peaceful nights overlooking the valley are ahead at the posh retreat. Festival season has wrapped; now, peaceful nights overlooking the valley from the hotel's hillside spot are ahead. COMMUNE WITH THE NIGHT: Springtime in the desert and its surrounding mountains brings flower blossoms (hello ocotillos and assorted succulents) and beautiful babies (which can run the gamut from bighorn sheep to wee lizards) and festivals. Many, many festivals, from the Coachella Music and Arts Festival to Stagecoach to Modernism Week. But taking in a more peaceful slice of the awakening season is possible, especially if you retreat to a spot that is a bit out of the fray and tucked closer to nature. And, of course, if you make your plans around May, when the festivals have wound down and there are just sunny days poolside to anticipate (and, of course, Palm Springs Restaurant Week). 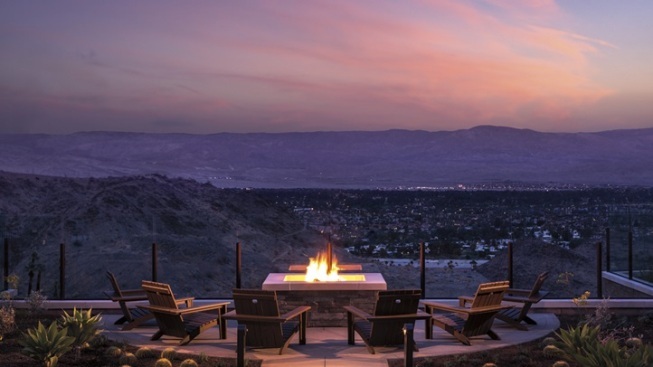 The Ritz-Carlton Rancho Mirage enjoys that above-the-fray, valley-vista-blessed location, meaning that should you find yourself by a firepit or at an outdoor table at State Fare Bar + Kitchen after sundown you'll be treated to that blanket of lights (Palm Springs, Palm Desert, Rancho Mirage, and Desert Hot Springs in the distance, plus a few wind turbines, if you can make them out, for good measure). But the hotel's unique above-it-all-ness isn't the only way to chillax and decompress, post-festival season. A PAIR OF POOLS... including one saved just for the grown-ups dot the grounds of the hotel, which sits in the foothills of the Santa Rosa Mountains. (Fun fact: That bighorn sheep statue at the front of the hotel pays sweet homage to the curious sheep that used to wander down onto the property.) The Edge Steakhouse shares those same above-the-valley-floor panoramas as State Fare, with tony cuts of meat to match. And even quieter outings, like hikes, can be pursued, too (the property offers twenty miles of desert-wending trails). Plus a new spa offering fifteen treatment rooms and private terraces (al fresco showers and 100-degree days seem as if they were custom-made for each other). The property's fresh look was imagined by the team from SB Architects. EASY-BREEZY TIMES: The end of festival season brings a calm to the desert resort cities. If you're craving extra stillness, and sit-back-and-chillax time, and those spectacular sweeping views, head up the hill to the bighorn sheep sculpture. For extra chillaxment, spend a minute or two breathing before the lobby's indoor cactus garden which, like much of the property, brings the outside in (though not, of course, the sheep).